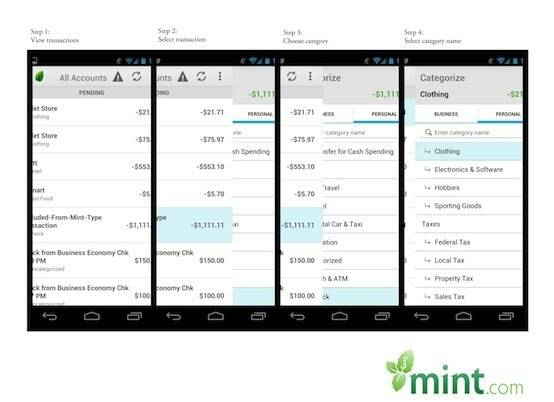 Mint.com has released an update to its popular Android app and tablets that incorporates features specifically requested by its users. Automatic refresh. Enables it to refresh data every 4 hours. Woohoo! Improved 4×1 Widget Support. Sorry about that! Faster transaction download times. Shazam! Speedier load times for account and transaction list pages. Boom! Quick categorization. From the transaction list on your phone, swipe left to quickly categorize a transaction. It’s really cool, check it out! • Organizing all your accounts in one place. One tap delivers a complete overview of your finances. • Interacting with your data. Pinch, tap and flick through your graphs to drill into spending by category, merchant or budget. • Getting personalized updates. New streaming delivery of account alerts, bill reminders and personalized advice helps you make smart financial decisions. • Syncing automatically across platforms. Changes to one platform – on the Web, smart phone or tablet – automatically sync on all devices. • Tracking cash spending on the go. The app’s geo-location capabilities help you cleanly and immediately categorize cash spending. That means no spending goes unaccounted for in your budgets. • Reviewing finances without an Internet connection. Storing data from the latest download allows easier viewing of finances, anytime, anywhere. Plus, you can always count on Mint’s bank-level security, including an application-level passcode, read-only account access and the ability to disable access from mobile devices to account information at any time from the Mint.com website. New and existing users can download the Mint.com Android App free from the Google Play™ store app.